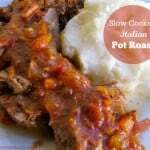 I first posted this Italian-Style Slow Cooker Pot Roast recipe way back on October 21, 2011. Back then everyone raved about it. And it remains one of my favorite pot roast recipes to date. The wonderful Italian flavor comes from simmering the roast for hours in red wine and tomatoes until it’s fork tender. Classic comfort food, hearty and homey, simple and delicious. Which is why I needed to be sure to include this slow cooker Pot Roast Italian Style in my Year of Weight Watchers Crock Pot Cooking. I found the recipe in Perfect Party Food: All the Recipes and Tips You’ll Ever Need for Stress-Free Entertaining from the Diva of Do-Ahead, by Diane Phillips, and modified it only slightly. The key to keeping this Italian pot roast lighter and healthier is using an eye of the round roast, which is very lean so it’s considered Simply Filling. And since there are no bones and virtually no fat, it keeps it’s shape during the long slow cooking. The sauce is loaded with lots of healthy low calorie vegetables including onions, garlic, carrots, celery and tomatoes. This luscious slow cooker Italian pot roast is perfect served over slimmed down Parmesan mashed potatoes, but it also would be great with pasta or polenta. Or for a great Simply Filling option, arrange thin slices of beef around the outside of a platter. Fill the center of the platter with a green vegetable such as sauteed spinach, steamed green beans, roasted broccoli or roasted asparagus. Spoon a little bit of sauce over the meat and serve the rest on the side. 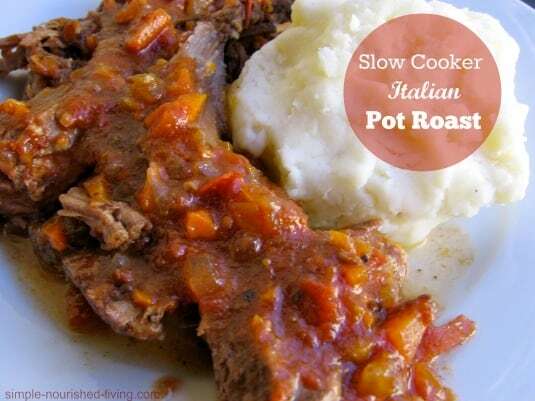 This slow cooker pot roast Italian style is classic comfort at it's finest - hearty and homey, simple and delicious. Sprinkle the garlic, salt and pepper over the roast and rub them in. Heat the oil in a non-stick skillet over medium-high heat. Add the roast and brown on all sides, cooking 2-4 minutes per side. Remove the roast from the skillet and place it in the slow cooker. Add the onion, carrots, celery and rosemary to the skillet. Cook, stirring often, until the vegetables are softened and the onion is translucent, about 7 minutes. Stir the wine and tomatoes into the vegetable mixture, scraping up any browned bits from the bottom of the pan. Add the tomato mixture and beef broth to the slow cooker. Cook on LOW until the meat is fork-tender, about 7 to 8 hours. Remove the meat from the slow cooker and place it on a platter or cutting board and loosely cover it with aluminum foil. If you want a thicker, more concentrated sauce, transfer it to a saucepan and bring it to a boil and then lower the heat and let it simmer for 10 to 15 minutes. Skim off any fat the accumulates on top of the sauce.